Camping is a terrific way to spend time in the great outdoors and feel connected with nature. It’s also perfect for doing diverse leisure activities that many people don’t have time for in their regular day-to-day life. It’s easy to think that buying a tent is a simple as just going to the store (or website) and selecting the one that you find the most appealing. But, there’s so much more to consider. You also need to think about how you’re going to transport your tent, and all other necessary camping equipment and supplies. Vault Cargo’s Cargo Hitch Carrier can assist with transportation. Their lashing straps and ratchet tie down straps ensure your items are safely secured. Combine an awesome road trip and camping trip with peace of mind. 1. Is the Tent and its Material Suitable for the Time of Year You Would Usually Camp? You need to consider whether you prefer summer camping, winter camping, camping in the spring or fall, or, indeed, at all times of the year. If summertime camping appeals to you, your tent should have good ventilation and mesh to keep bugs out. Material should be lightweight and breathable, letting you stay cool on sultry nights. Good summer tents should also be able to keep you dry in summer showers and storms, and sturdy enough to cope with a decent level of wind. When buying a tent for winter use, you need to be confident that it is suitable for extreme conditions. 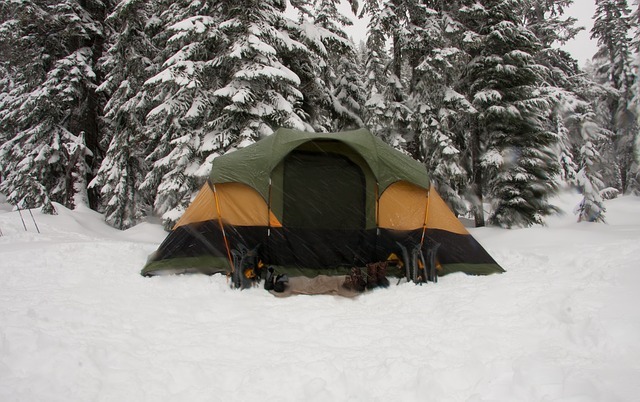 Winter tents are made from tough materials and typically have lots of guy ropes to firmly tether your shelter. Poles are robust. Convertible tents are ideal for people who love camping all throughout the year, no matter the weather and temperature. Though usually heavier and bulkier than other types of tents, they are designed to keep you cool in the summer and warm in the winter. They are also designed to allow airflow in the heat and to withstand harsher conditions too. They generally feature mesh with zip-up nylon panels. A range of accessories is often available to further adapt the tent for the conditions. 2. How Big Does Your Tent Need to Be? Tents are available in various sizes, offering different levels of comfort and interior space. It is, therefore, important to consider how many people will typically be going on your camping trips before actually buying a tent. You may be tempted to just splurge and go for a larger tent to err on the side of caution, but remember, with extra size comes extra weight too. If it’s usually just you and your significant other, a two-person tent is probably adequate. If it’s the whole family, you’ll obviously want to invest in a larger tent (or several smaller tents). Keep in mind that tents may state that they sleep a certain number of people, but conditions can be rather cozy. You may want to consider purchasing a larger size, especially for longer trips. Buying a bigger tent is also recommended when camping with kids. If a member of the group tends to move around a lot at night or particularly values a lot of space, a bigger tent is also recommended. Think about how tall people are; you might need a longer tent to ensure comfort. 3. Are There Any Particular Tent Design Features That You Would Prefer? Tents have a variety of features to suit the preferences of campers. Ultimately you need to consider what would make you the most comfortable. It helps to look at a few different options before making up your mind. Take time to weight up the pros and cons of different designs before buying a tent. Some tents provide greater height than others, meaning that you can stand up straight in some, whereas in others you would always have to stoop. There are tents with poles, which require more effort when setting them up, and those that have a freestanding design. If you opt for a tent with poles, you must also consider the pole material. If you plan to backpack and carry your tent, you’ll obviously require a design that it is lighter. Tents come in diverse shapes too, including wedge shaped, domed, pyramid shaped, A-frame shaped and those that are like a tunnel. Some tents have one main door and others have a door at each end. Having clear answers to these basic questions makes buying a tent that’s suitable for you a lot easier.